What do you think about when you hear the word stress? For some it might be the feeling of being trapped inside a pressure cooker with seemingly no simple way to let the pressure off. For others,it may be that they do their best to push it aside, hoping or praying that by some miracle that their life will one day be easier. Whatever the case is for you I want to assure you that there are some very fast and easy ways to get rid of stress. Do you believe that anyone in their right mind would want to live a stressful life? Obviously, for any intelligent human being the answer would of course be no. However, after years of teaching, counselling and coaching people to change their lives for the better I noticed a common trait. The trait is that many people, despite what they tell themselves, are addicted to stress. So what do I mean by that? Being addicted to stress means that they get a benefit from it in some way, even if the benefit is not necessarily good for them. These benefits can range from they need a certain amount of stress to stay motivated and get things done to giving them something to complain about to anyone and everyone that’ll listen. Of course, these are just a couple to examples out of hundreds, but you get the picture. When you are looking to find ways to ways to reduce stress in your life you might firstly ask yourself this question, “Am I ready to have less stress and more calm in my life?” Then, before you answer the question, take a moment to write down what benefits you are currently getting from stress in your life. Once you’ve answered the question and you have made the decision to have less stress in your life, and you’re ready to take immediate action to make it happen, then check out the video below for the top four ways to ease stress in just minutes a day. Well, how did you do? Did the video help you find an effective strategy that you can start to use today to reduce the levels of stress in your personal or business life? Stress really can take a strangle-hold of your life if you leave it unattended, which is why I made sure to give you the very best ways to have less stress in your life. 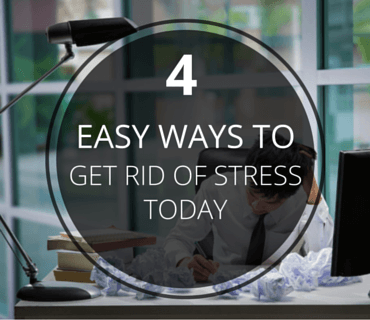 If you enjoyed this post on 4 Easy ways to Get Rid of Stress Today, re-tweet and comment please.